"Too aggressive in following me on every device or browser" was the most common complaint mentioned by 41.7% of those surveyed. 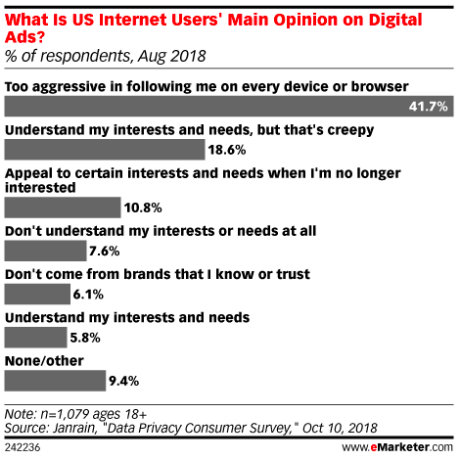 Unfortunately, digital advertising's ability to "stalk" people across devices and browsers is exactly the reason marketers love them. The first challenge of advertising is over coming the Law of Familiarity". Simply put, this means people are more likely to do business with companies they are familiar with. One of my favorite examples of the Law of Familiarity is covered in Harry Beckwith's book, Selling the Invisible. You are on the road, taking a family trip to visit your parents. You have been on road for hours and your wife tells you it is time to stop and get the kids some lunch. So you pull off the highway and are faced with a decision. In front of you is a cute diner - Chef Jeff's Hamburgers. Next to it is a McDonalds. Where do you stop? Odds are you will go to McDonalds. Not because they have the best hamburgers or the best milkshakes. You will stop there because you only have 45 minutes to eat and get back on the road. And they are familiar to you. It is a safe choice. Chef Jeff's may have the best food in town, but you will never know because you will make the safer, familiar decision. And that is why marketers love digital ads. They may be annoying, but they are effective. Frequency of message allows you to break down the barrier of Familiarity. When I first started out in marketing the frequency needed to break through and become familiar was seven to eight impressions. Eight ad impressions was enough for a brand to register in the mind of the average consumer. Today we are smothered in advertising messages from the time we wake until the time we go to bed at night. Eight impressions have zero chance of cutting through the advertising clutter. Today it takes twenty or thirty impressions just to get past the consumer's advertising defenses. Maybe forty or fifty impressions before "Chef Jeff" even registers an impression. So that is why you see all these ads for a brand across devices and browsers. We are trying to make an impression. But I predict that this is all about to change. I am working on a new advertising platform that does not use devices or browsers. I am going to beam my client's messages directly into your dreams. Sleep my pretties, sleep.